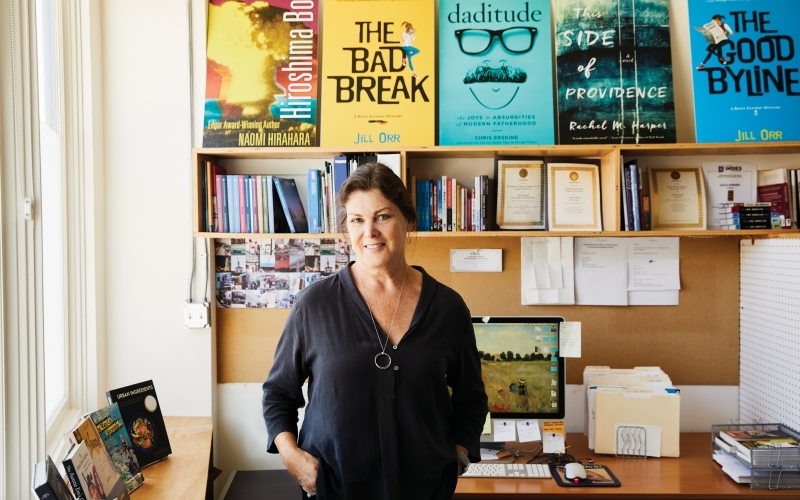 Colleen Dunn Bates runs Prospect Park Books in Altadena. Prospect Park (the name comes from Dunn’s old Pasadena neighborhood) has published more than 70 titles, with 12 scheduled for 2018. Among its authors are mystery novelist Naomi Hirahara, television writer Phoef Sutton, and Los Angeles Times columnist Chris Erskine. The office walls are lined with bookshelves and over-size cover images. On a Thursday afternoon, two staffers work on upcoming titles at computers, busy in a focused way. Prospect Park is one of several general interest presses that, together, are changing the perception that Southern California is not a landscape for publishing. Just down the street, Red Hen Press, which was founded in 1994, issues between 20 and 25 works of poetry, fiction, and nonfiction every year. In Eagle Rock, the five-year-old Unnamed Press will release its 50th book in July: Its output is primarily literary fiction and works in translation. From a third-floor office in downtown’s Old Bank District, Rare Bird publishes something like 50 titles annually, both new projects and reprints of older work. Add to this smaller imprints—Writ Large Press, which seeks, its website notes, to publish “overlooked Los Angeles writers,” and Lil’ Libros, with its bilingual board books for young children—and one can start to see a shift in the cultural production of Los Angeles, which, despite its history as a creative capital, has never really been a publishing town. Such a community can be found at events across Southern California, from author evenings at downtown’s Last Bookstore to staged readings, in venues such as Hollywood Forever cemetery, put on by PEN Center USA. In the back room of its Echo Park store-front, the nonprofit 826LA offers workshops for young writers; in Venice, the venerable literary center Beyond Baroque celebrates its 50th anniversary this year. Southern California, of course, has a long history of literary culture, dating back to Helen Hunt Jackson’s 1884 novel Ramona, if not before. Beginning in the 1920s, after he opened his first store in downtown Los Angeles, bookseller Jake Zeitlin inspired what came to be known as the Zeitlin Circle, a group of writers and intellectuals who helped shape the city’s cultural life. Zeitlin served as mentor and colleague to Carey McWilliams and Aldous Huxley and helped bring the latter to California in 1937. Around the same time, Stanley Rose’s bookstore, next door to Musso & Frank’s on Hollywood Boulevard, became a gathering place for writers such as John Fante, William Saroyan, Nathanael West, and Budd Schulberg; it is said to have been a model for Arthur Geiger’s bookshop in Raymond Chandler’s The Big Sleep. Previous articleDid Aleister Crowley Use an Occult Temple in the Hollywood Hills?